The majority of tourists enter Mongolia through three entry points. By flight to the capital Ulaanbaatar (Ulan Bator). By train or car from China (Zamin-Uud border crossing). By train or car from Russia (Sukhbaatar/Altanbulag). See the detailed Google map of all the border crossings, with data on each crossing. Zoom in and click the icons to see details. Following is a description of - flight, train, road and trade border crossings. All International flights land at Chinggis Khaan airport in Ulaanbaatar, with one exception - flights from Kazakhstan land in Olgii in west Mongolia, tourists are permitted to enter Mongolia through Olgii, with this flight. 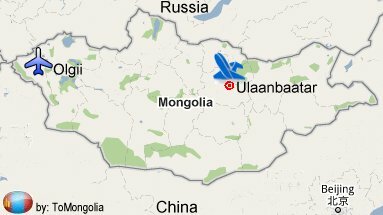 A flight from Hailar in China does have a stop over in Choibalsan in east Mongolia, before reaching Ulaanbaatar, but tourists are not permitted to get off at Choibalsan. For more see the Flights page - all airlines and all flight options into Mongolia. 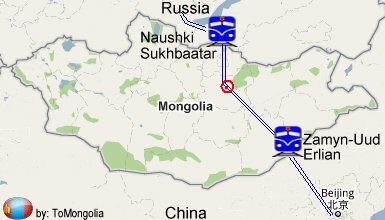 The trans Mongolian train connects Russia and China through Mongolia. A few trains a week reach Ulaanbaatar from both countries. For more see the TransMongolian train page for detailed train options. The Zamyn-Uud/Erlian from China and Altanbulag/Kyakhta from Russia, have full services for tourists. The others have limited services. The main issue is limited options for transportation to, from and across the border. You may use one of these, if you enter with your own car, bike, or pre-arrange for someone to meet you and take you across and beyond the border crossing. Crossing by foot is prohibited. some are open 24h, and some open on weekends too. All road border crossings are closed on national holidays. (Train and flights operate all year round). Dates of closed borders: New year January 1st, three days of the Chinese lunar new year (annually occurs on different days of the month). May 01-03, October 01-03, two days of the Mongolian lunar new year (annually occurs on different days of the month). March 08, June 01, July 11-12, and November 26 annually. Tourists can not enter through any of these crossings. They are used for trade mines export, and for locals with Chinese or Russian passports. In addition to these there are several temporary border crossings used by local herders. For complete details see the Google map. In general there is no need for a guide when you cross into China. With your own car you need a guide. About motorbikes I do not have any specific information, I assume it is the same as cars. I'd like to know if there's information about people actually crossing the border to China at Bichigt Zuun-Khatavch. I'd like to use this border point in 2 weeks, but apart from this post all Google comes up with is a group of tourist being arrested for coming near the border point (not even wanting to cross). Any way to be sure the situation has changed since then? Where does the information about this border crossing opening up come from? There is no information from tourists crossing this border port yet. It apparently became international only in late 2014. If you are adventures and have the time to check it out, you will lead the way for future tourists. In case it is closed you will have to travel back to Zamyn-Uud. (long distances). The information comes from the Mongolian news website http://www.infomongolia.com/ which unfortunately is down at the time of posting this response. Please let us know how it worked out for you. Thanks so much for the info and quick answer. We are probably willing to give it a try, although it seems there is no border town anywhere near, which makes is quite hard for us, as we will be hitch hiking there. Any idea how many cars there would be crossing there? One of our worries is that there's simply no one to take us over the border. If we do go I'll update here. It seems you are adventures. This is one of the most remote border ports. It will open up amazing new options for touring across Asia. There are commercial trucks going through this port every day. It is freezing cold now, (-20c) dress well. I would consider combining hitch-hike and public transportation. In any case as a tourist you are expected to share the petrol cost even when you hitch hike. The border post is in Sukhbaatar (Сүхбаатар) aimag (province). From Ulaanbaatar take a bus to the aimag capital Baruun-Urt (Баруун-Урт). From the town market take a shared jeep to Erdenetsagaan (Эрдэнэцагаан) sum (district). From there to the border, you can negotiate the cost with any local driver. The other longer option is through Choibalsan. Take with you all the place names in Mongolian, as no one speaks English in these remote locations. Leave sufficient visa time to go back to Zamyn-Uud, in case the border is closed. Let us all know how it worked out. Though all blogs are blocked in China, so it will have to wait. You can email me, and I will post your experience here. You are true explorers, following Marco Polo's footsteps. Hi, I am wondering if you have any information about driving across the border from China (Erlian) to Mongolia (Zamyn-Uud) in a China-registered car? Would I be able to get through and drive all the way to UB from Zamyn-Uud? There is no problem driving your car all over Mongolia, no matter what original registration the car has. The car should be registered on your name, to make sure it is not stolen. In Mongolia you will get a 30 day temporary import document, to make sure you leave with your car. If not you will pay the full customs tax as if you imported your car to Mongolia. At the border you will also purchase a third party liability insurance. could you recheck about border crossing at Khankh/Mondy for international travelers? or you can give some link to confirm that information. The Russian official website did show a few weeks ago the Khankh/Mondy as multinational. Now it syas it is only bilateral (Russian and Mongolian citizens). The Mongolian official website in Mongolian says it is multinational. In English - (this is a translation of the official website) it also says international. I would appreciate a report on the procedures, costs, and photos of the border post. we are traveling with our own vehicle from Vladivostok to Europe and would like to understand if we can enter Mongolia in the East and leave in the west? 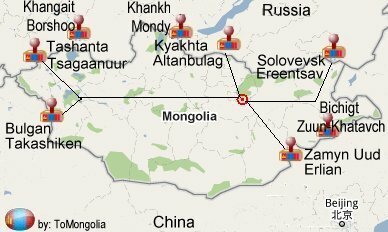 So, has anybody recent experience with border crossings between Russia and Mongolia in the far east (Ereentsav Solovevsk border crossing) or West-Mongolia (Tsagaanuur Tashanta border crossing)? If so, are roads passable on both sides and boarders open for european travelers? The roads are dirt roads with stretches of paved roads as you get closer to Ulaanbaatar. The dirt roads are passable. If you have a 4x4 there is no problem at all. If not a 4X4 it is also passable 90%. you might need some road work when crossing difficult terrain. When it rains you might have to wait for the dirt road to dry out within a few hours. There are no road signs, so navigation in parts might be a challenge. Any nomad you meet on the way will point you in the general direction. and please report your experiences. There is no bus to the Burgastai port. You can hire a van. This border is for trade only, not for tourists. We are planning to drive to ulaanbaatar from Ulan Ude tomorrow. I've just read your post about getting third party insurance at the border. Could you give more information about this, as most info we have read or from people we have spoken to, suggests that it is hard to find. At this road border post you intend to cross, they will send you to the appropriate office at the border to get the insurance. It is an easy procedure. Please write back your experience with details, costs etc. I want to cross the border between mondy and khankh. Does any body knows if it is possible for every nationality or just to mongolian and Russian citizens? I made research and there is no sure answer. but there is no published evidence of tourists doing so. May you be the one to test it? There is some confusion about the Mondy Khankh border post, just north of Khovsgol lake. The Mongolian official site says it is open for all nationals. The Russian official site says it is open only for locals - Russians and Mongolians. The agreement between the two countries had a condition saying that the border will open for all nationals only after some basic infrastructure will be completed. I do not know of any tourist crossing this border yet. As said above we all need some brave explorers to survey the border post and publish results. I tested it and the answer is... tchan tchan tchan tchan... bilateral! I hitchhiked my way back and now I'll cross the border from ulan ude to ulaanbaatar! I want to cross the border to China in the west of Mongolia, to try to go directly to the Himalayas. There are two roads in the west of Mongolia that seem to go to China. Do you know if it is possible to cross it being a European citizen? The only road you can take in West Mongolia into China is at the Bulgan border post. The other roads in west Mongolia are for commercial trucks only, not for tourists. Thank you very much Dan!! This border post does not cater for individual tourists. It is used by several thousand truck a day exporting coal from Mongolia to China. Chinese tourist agents affiliated in that region can arrange for groups crossing this border post into Mongolia. Groups travel through a separate gate, and all arrangement at the border are arranged by a representative of that tourist agency. This is an excellent choice to cross from China directly into the Mongolian Gobi. I'm preparing a trip from France to Japan this summer, through Belgium, Germany, Poland, Lithuania, Latvia, Russia, Mongolia, and then Japan. - Are both of theses two borders opened to foreign traveller's ? From what I've read, the answer seems to be yes, but is it still the case in 2018 ? - Second question about closing of borders during the Nadaam : my curent schedule is to enter in Mongolia on July 7th, and leave in Ereentsav on July the 12th, then during Nadaam. I've read several contradictories information about closing of all the Mongolians border posts during Nadamm. So, can you confirm these 2 borders will be closed during Nadamm, and if yes, on which date exactly during july 2018 ? Both border crossings (Kjachta/Altanbulag and Solovesk/Ereentsav) are open to ALL passports. During Naadam festival trains and flights operate as usual. Thanks vey much Dan for your answer. I will then arrange my dates accordingly. But just a confirmation for Kjachta/Altanbulag : other guys told me this one was the only one remaining open, even during Naadam ; do you think they are any chance ? As far as I know, Altanbulag will be closed during Naadam for tourists. Maybe trade go through as it is the main entrance from Russia. Again, thanks Dan. I will change my schedule then, as I can take the risk to be blocked at the border :) Mongolia is one of my dream, so.... I can't miss ! Me (JMP) again. An other question about crossing the border at Ereentsav to re-enter Russia. I've read on a forum that it was necessary to have a special permit to enter the border area in Ereentsav, meaning it was not possible to go to the border without this permit. Can you confirm this ? Thanks for your help Dan ! 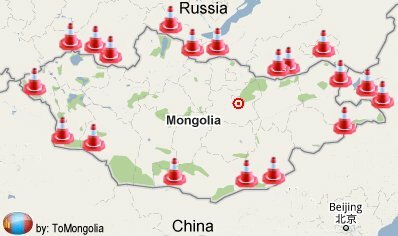 On the Mongolian side, if you stay on the main road to the border, there is no need for a permit. On the Russian side you might need one, obtained in Russia. Hi, I plan to go from Gansu province in China to Altay region in Russia across Mongolia. 1) Is Bulgan border still open for tourists? I hope it is, but I don't see here any update from this year (2018.). I should be there about August 16th. 2) Do you maybe have any information how to get to the border from Dunhuang in Chinese Gansu province? I found only mentioning of bus from Urumqi to the border. You don't know for transport from other Chinese cities to the border? 3) If there is any other transport, I can take that bus from Urumqi to Bulgan border. Do you know does that bus work every day? On other place I saw very old information of the bus from Urumqi to Qinghe, then minivans from Qinghe to Takashiken, then cheap taxi from there to the border? Can I do that in one day for sure? It is information from 2011, you don't know is that even faster and better transport option now? 4) If I take those buses/taxies from Urumqi to the border and to cross the border to Bulgan, I guess that now I don't need any special license from Chinese authorities? I saw it was mentioned before. I don't need it anymore, right? Or if not, can I find minivans from Bulgan to Khovd and then from Khovd to Olgii and Tsaganuur? 6) Is it possible even to find jeep from Bulgan to Tsaganuur or at least 2 jeeps across Khovd? How expensive can be such jeep transport? 7) How much time I will need from China's to Russia's border? 2 days is optimal? 8) Is it possible to find the place for sleeping, anything like hostel, on my way from China's to Russian border? What do you recommend related to this? 9)If I travel 2 days from China's to Russian border (Bulgan to Tsaganuur), I expect to be there on Saturday or Sunday. Is Tsaganuur-Tashanta border closed during weekend? Hello, do you know if there is any rent a car in Zamyn Uud?